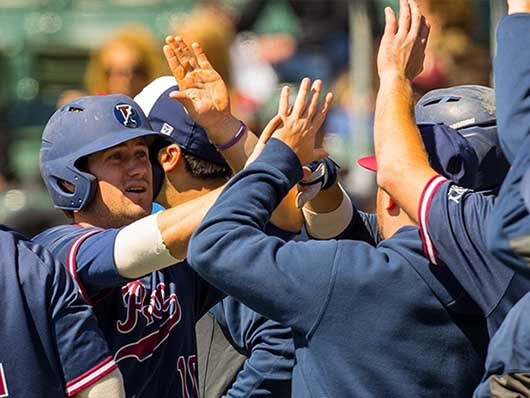 The University of Pennsylvania baseball team plays for its first Ivy League title in 22 seasons - and sixth in program history - Tuesday when the club opens a three-game Ivy League Championship Series against Red Rolfe Division champion and host Yale. The winner of the best-of-three series earns the Ivy League's automatic bid to the NCAA Tournament which is set to begin June 2. Penn returns to the Ivy League Championship Series Tuesday for the first time since 2007 after clinching the Lou Gehrig Division title with a 6-3 win over Columbia May 7. The Quakers have claimed five Ivy League titles to date - 1975, 1988, 1989, 1990, 1995. With two wins and a berth into the NCAA Tournament, Penn would attempt to win its first game in a regional since the 1990 season when the Quakers took down California-Santa Barbara in the West II Regional in Tempe, Ariz. Reigning Ivy League Player of the Year Tim Graul lived up to all the expectations that come with such an honor, as the senior claimed the league's batting title with a .468 average in conference play this season. Graul also paced the Ivies in hits (36) while ranking second in slugging (.779) and on-base percentage (.517), third in doubles (9), and fourth in RBIs (20). On the mound, Jake Cousins tied for the league lead in wins (4) and ranked third in conference ERA (3.09) while fellow staff member Gabe Kleiman finished fifth (3.21). Adam Bleday ran away with the strikeout lead with 42, while also posting an incredible 11.34 K/9 average in five Ivy starts. Like Penn, Yale also seeks its sixth Ivy League title this week and its first since 1994 when the Bulldogs clinched the series over the Quakers.